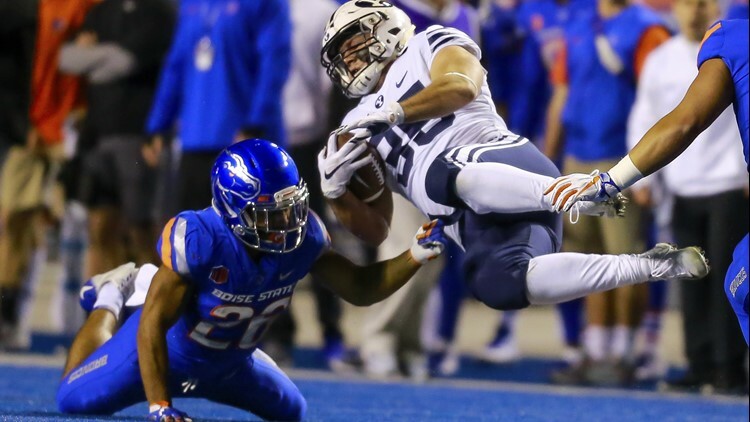 BYU's Brayden El-Bakri is spun to the ground after being hit by Boise State's Avery Williams during an NCAA college football game Saturday, Nov. 3, 2018, in Boise, Idaho. Boise State won 21-16. Boise State football: Another Bronco walk-on on the rise? Four Boise State players drafted in the NFL in the 21st century were originally walk-ons. Not saying that Dylan Herberg will be the next, but the lack of a scholarship never stopped anybody. BOISE, Idaho — Wednesday, April 10, 2019. Two years ago, a walk-on named Avery Williams was tabbed as a defensive captain for the Boise State spring game. That was enlightening at the time. Then Williams promptly made the only interception of the day to end the spring. And when Labor Day weekend rolled around, with a scholarship secured, Williams scored on an electrifying 81-yard punt return against Troy the first time the Broncos touched the ball in the 2017 season. He was starting at cornerback by early October. There may not be a redshirt story like that on this year’s squad, but Timberline High grad Dylan Herberg did his best imitation of Williams last Saturday. Herberg, a STUD linebacker, turned in three tackles, including a sack. He added a quarterback hurry and two pass breakups, the second one coming on the final play of the game. Did last Saturday mark the final Boise State spring game in the career of Curtis Weaver, who effortlessly logged two sacks on the blue turf? Draftniks would have you think so. From the way-too-early lists of 2020 mock drafts comes one from Charlie Campbell, the Senior Draft Analyst for WalterFootball.com, predicting that Weaver will forego his senior year and be a first-round selection next year—No. 20 overall to the Atlanta Falcons. Campbell projects him as an outside linebacker in a 3-4 defense, which is basically what he is now for the Broncos. Weaver, of course, is a two-time All-Mountain West honoree who has amassed 20.5 sacks in his first two seasons as a Bronco. The first two games of the 2017 season told you all you need to know about what kind of trajectory Weaver was on. In Boise State’s opener against Troy, Weaver recorded the first two sacks of his career, the second one a pivotal takedown in the third quarter of a close game that ended up a 24-13 Broncos win. A week later, he scooped up a fumble by Washington State quarterback Luke Falk and ran 55 yards for a touchdown. Now he already ranks second on Boise State’s career sack list. If Weaver opts for the NFL Draft next winter, it would mark the sixth straight season a Bronco has declared early. Boise State’s Mountain West football rotation switches the next two seasons, with UNLV, Hawaii and San Jose State replacing San Diego State, Fresno State and Nevada. The change is only a positive if the Rebels, Rainbow Warriors and Spartans are good—and they haven’t been lately. UNLV wrapped up spring football last Saturday. The Rebels return 19 of 22 on offense from last season’s final two-deep and 17 on defense. UNLV features one of the Mountain West’s most electric players, junior quarterback Armani Rogers. The Broncos visit Sam Boyd Stadium on October 5. Boise State coach Leon Rice told the media Monday that Derrick Alston won’t throw his hat into the NBA ring this spring. Alston wants to be at the top of his game before he goes out auditioning. Total agreement here. Alston was raw but occasionally spectacular as a sophomore this past season, averaging 13.4 points per game with eight 20-point games and two 30-point efforts. All that after scoring just seven points total as a redshirt freshman. The cart would have been ahead of the horse had he entertained NBA hopes this year. But after his junior year, Alston could—at the very least—get input from NBA coaches and still return to Boise State before the draft declaration deadline. Colton Saucerman—and his famously massive red beard—bring some moxie to the Idaho Steelheads in time for Friday night’s puck drop against Utah to open the Kelly Cup Playoffs at CenturyLink Arena. Saucerman played 10 games for the Steelheads earlier this season before being called up by Utica of the AHL on December 12. He scored three goals and added five assists with 15 penalty minutes in his stint as a Steelie. More importantly, the veteran defenseman has played in 44 ECHL playoff games the last three seasons, posting six goals and 16 assists. Saucerman’s beard went viral once he landed in Utica. It’s definitely a calling card. It’s the grand opening of Dodger Stadium in the hills above downtown Los Angeles, but the home team loses 6-3 to the Cincinnati Reds. The Dodgers had played their first four seasons in California at the L.A. Coliseum. Now, Dodger Stadium has stood the test of time. Chavez Ravine worked some magic most of that summer for the Dodgers, who would go into September with a healthy lead over rival San Francisco. But the Giants would catch them on the final day of the season—then beat them in a three-game playoff for the National League pennant.